I would like to wish you all a fabulous Christmas and I look forward to 2018 where we can expect Jamie’s new album (all original songs), as well as some live shows!!. On Thursday 21st December Jamie posted a lovely roundup of 2017 on his Facebook page. I thought this was a really nice personal touch and it’s really informative too! If you haven’t seen it yet, take a read below. So as we are nearing the end of another year, I thought now is the perfect time to share with you the most popular blog posts from 2017. So put your feet up with some hot chocolate and enjoy. Take a listen to Jamie’s version of “Be Our Guest” which features on the new album Jazz Loves Disney 2, the track also features Eric Cantona. Do you know everything there is to know about the UK’s biggest Jaz artist? 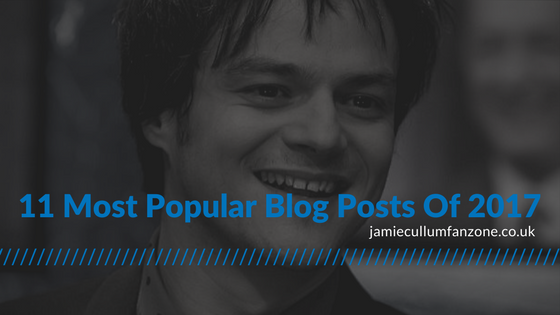 Here are 21 fascinating facts you probably don’t know about Jamie Cullum. During this interview, Jamie provided an update on the creation of his new album. It’s great to hear that Chris, Brad and Jamie are writing songs together, read the latest tweets here! Jamie will feature on the new Disney album Jazz Loves Disney 2 – A Kind of Magic with his version of “Be Our Guest” from the film Beauty & The Beast. Also on the track with Jamie is Eric Cantona. The latest roundup of Jamie Cullum news. This week Jamie gave us a sneak peek into the recording of his new album which he is calling #LP8 until the official title is announced. A simple piano-vocal makes me very excited!! In August I asked you, the fans on Twitter & Facebook, what your top 3 Jamie Cullum songs are and I was overwhelmed with your responses. This question prompted a really interesting conversation among the fan community, and it was great to find out which songs everyone loves the most. This is the behind the scenes video from the McArthur Glen Christmas advert 2016. Including the recording of Jamie Cullum’s ‘Show Me The Magic’ track at the famous Abbey Road Studios. So there you have it, this year’s most viewed blog posts. Which one was your favourite? let me know in the comments below. If you don’t want to miss any of the latest news & conversations, sign up for the free weekly newsletter.